An old friend came over for dinner last night and he happens to be just as health conscious an eater as I am these days. I had a hankering for veggie burritos and when I mentioned my idea to him, he expressed more excitement than I could ever expect, so burritos it was! Chop peppers into slices and place on a baking sheet and bake for about 15 minutes at 325 degrees. If you have a large enough baking sheet, place Ezekiel tortillas on it separate from the peppers, making sure to remove after 5-7 minutes or before they start to toast (you just want to warm them up a bit). While peppers are cooking, make the guacamole by combining the avocado, red onion, lime and salt and garlic pepper to taste. In a small sauce pan, add beans and scallions and cover and cook on medium heat for about ten minutes. Strain and discard any liquid from the beans and scallions. Place beans and scallions in the middle of the tortillas, top with guacamole, peppers and cheese. 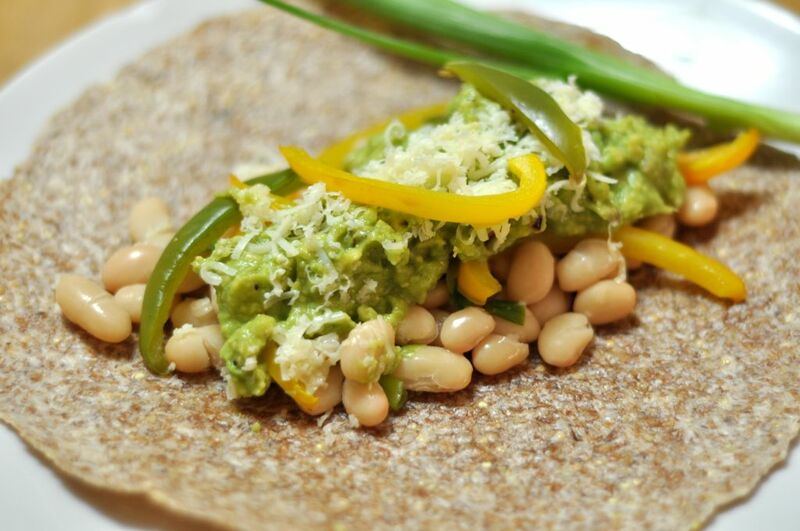 This entry was posted in Recipes and tagged Avocado, cannellini beans, extra sharp cheddar cheese, ezekiel tortillas, green peppers, Gret Northern Beans, lime, photoblog, red onion, scallions, yellow peppers.